This EP is part of the very foundation that created UK Garage around ’94-95 with people like Tuff Jam, Grant Nelson & Jeremy Sylvester. It is sort of the missing link between the US and UK scenes. It’s with productions like this EP from people like MK, Masters At Work, Kerri Chandler that UK dj’s would play pitched up, that created the faster bumpier sound of UK Garage. If you like UKG, then you have to know about Todd Edwards, pretty much the only US based artist to be part of the royalty of that UK sound for the past 15 + years. A style that to this day remains very influencial in the new school producers like Disclosure and others. His unique production style made up of crazy cut-up vocal chops still sounds fresh to this day! 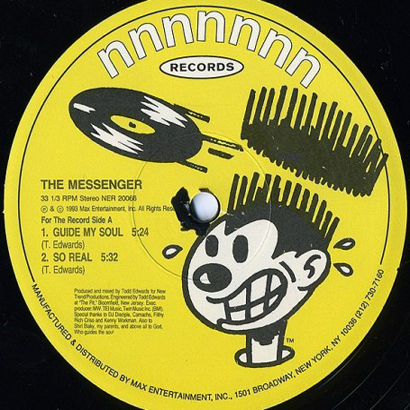 Well, this right here is his very first EP on legendary Nervous Records recorded in 1993 under the name “The Messenger”. Oh, and for all you heads… you can still scoop this up on discogs for peanuts!! !